Driving in to work lately, you may have noticed a few piles of bricks standing next to the road in Techno Avenue. Or perhaps you’ve seen groups of people in workmen’s clothes laying these bricks into what appears to be, on the face of it, a simple footpath. What would have escaped your attention, if you had remained in your car, is that the path is in fact a beautiful new work of art by mosaic artist Lee-Anne van Wyk, the details of which are immediately and abundantly evident to all those who walk upon it. 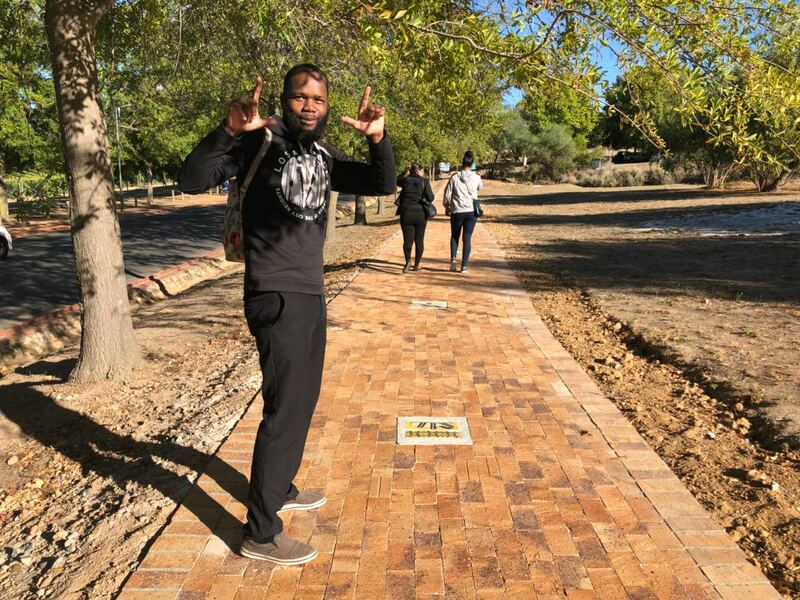 Running from just after the first traffic circle at the Techno Park entrance to the second circle at Quantum Street, Van Wyk’s artwork is a fruit of the Techno Park management body’s drive to enhance the environment through public art. The path, which has been constructed with the practical view in mind of improving the experience of the many workers who enter and leave the Park on foot daily, has been inlaid with original kiln-fired portraits of local people, each cast into a 30cm cement circle, and placed alongside beautifully patterned, multicoloured tiles. Van Wyk explains that the sheer diversity of Africa’s many cultures inspired the design for the footpath. She chose portraits of local people that each capture a part of the essence of the African soul – a soul that, according to her, “cannot easily be described, but is immediately recognisable” – so that the work as a whole portrays a unified picture of the richness and vibrancy of that soul. Norton mentions that Stellenbosch Municipality was fully supportive of the project. The Superintendent of Urban Forestry from the municipality, Maindren Chettiar, was involved with the project to ensure that none of the trees in the area were placed under undue stress during construction, and to ascertain that the path was far enough from the trees so that roots would not start pushing up bricks and tiles later on. “We were very concerned about the environment during the entire process,” says Norton. In addition to safeguarding trees, she says, they were intensely aware of the drought situation, using only non-potable water during construction. She also hopes that more commuting cyclists will feel encouraged to make use of the path, relieving some of the traffic stresses that Techno Parkers face on a daily basis. If Norton has her way, the footpath running along Techno Avenue is only the beginning. “We would love to do more paths for Techno Park in the future, using different artists to tell different stories,” she says. For the current project, Van Wyk’s artist statement will be translated into Afrikaans and isiXhosa and put up at the beginning and end of the path, so that people walking along it can have a better sense of the story it tells. * On the topic of cars, cycling and traffic, we are encouraged to see that many of you have responded to our previous story on the traffic situation in Techno Park. We are in the process of reviewing your suggestions and are trying to come up with a plan to enable a more robust form of community engagement around such topical issues. In the meantime, please rest assured that your suggestions have been passed on the Techno Park management body, who share your concerns about the traffic. Thank you for the nice write up. It was a joy to work on this project. Thank you for the opportunity. Gorgeous tiles. Excellent, original work, Lee-Anne!